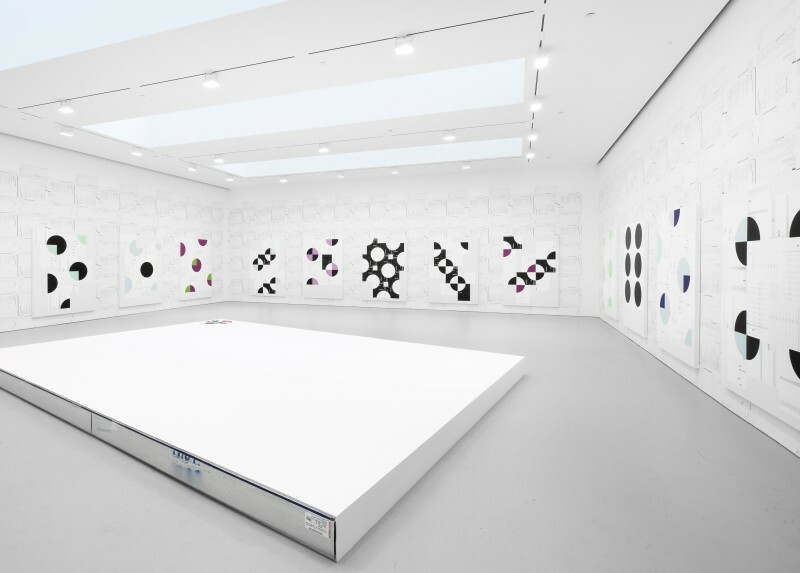 David Zwirner is pleased to present an exhibition of new work by Michael Riedel, on view at the gallery’s 533 West 19th Street space. This will be the artist’s third solo show at the gallery. 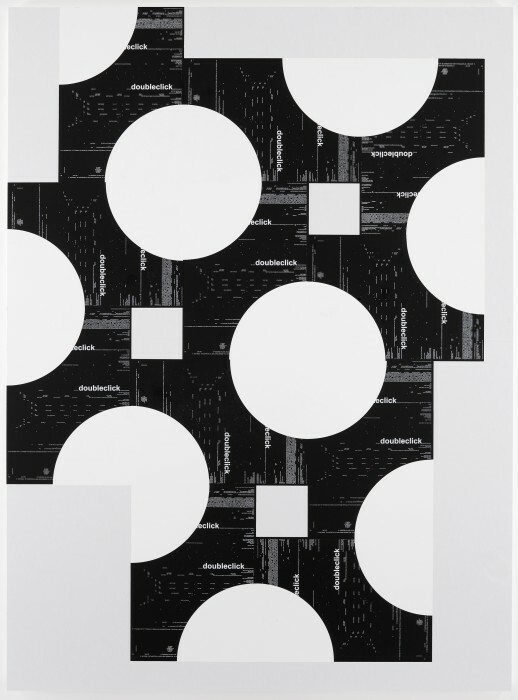 This exhibition will present new silk-screened “poster paintings” by the artist. 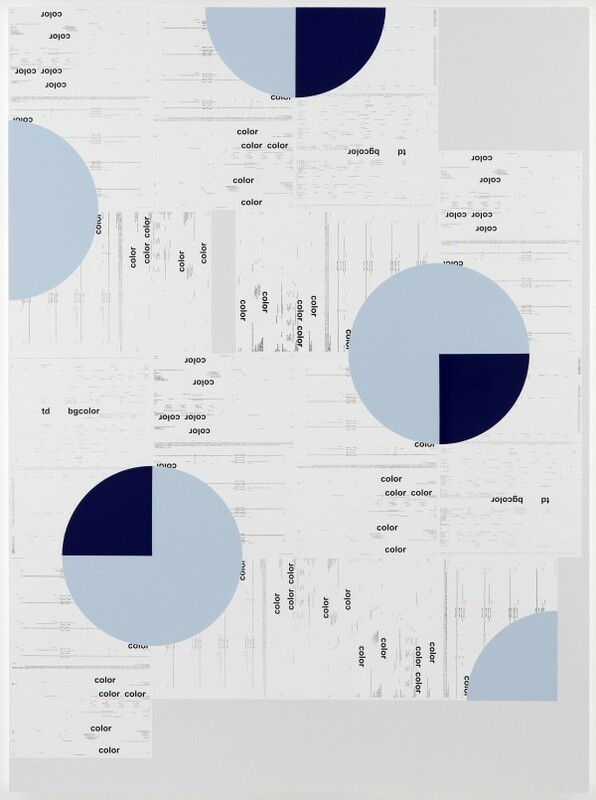 To devise these canvases, Riedel accessed websites where his works were mentioned—including his MoMA artist page, http://www.moma.org/collection/artist.php?artist_id=28773, and an exhibition listing site—and used the “select-all” function to copy-and-paste the contents into a textbox in InDesign, from which the posters were ultimately printed. 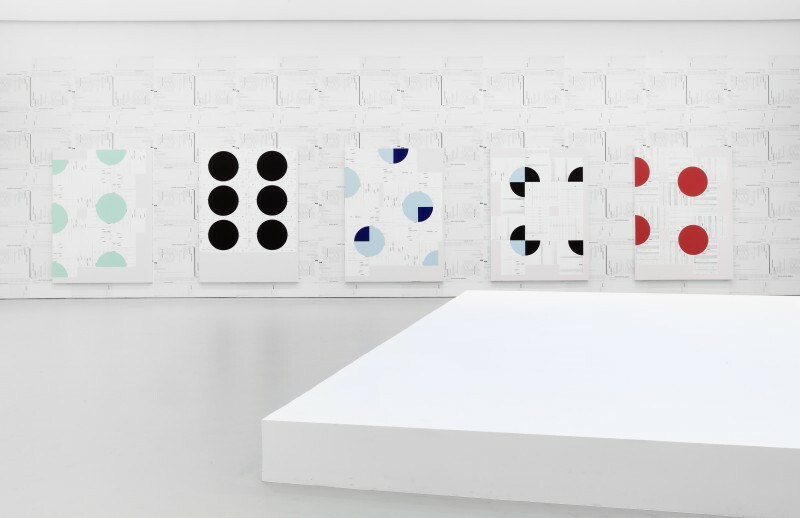 Divorced from a graphically-designed layout, the words appear in a linear, but nonsensical, order and include algorithmic commands, search keywords, and links, intermixed with miscellaneous sentences on the artist, copyright phrases, and contact information. 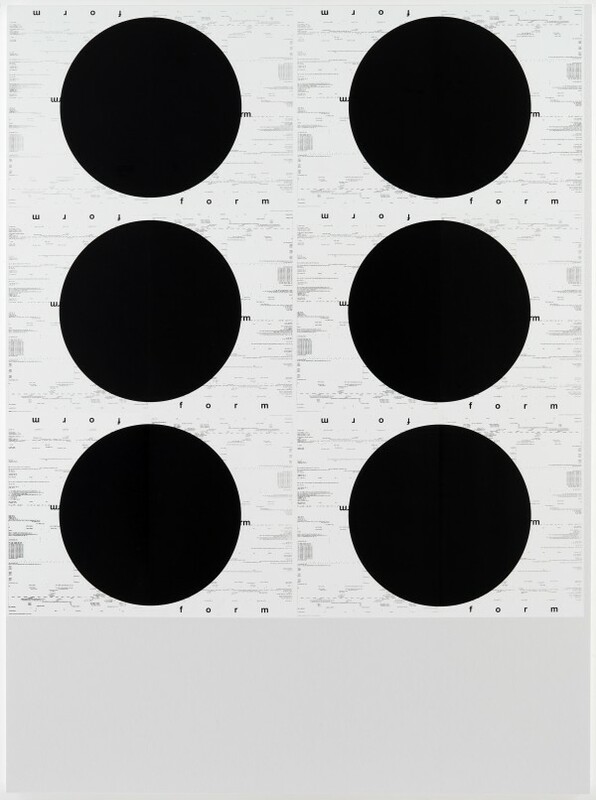 Riedel afﬁxed a quarter of a circular shape to the corners of each poster, partially obscuring the text. When shown next to one another, the four quarters almost resemble the spinning wheel that appears on a computer screen when the harddrive is busy processing information. As if signaling that an action is about to be performed—or simply that the computer has stopped functioning properly—the posters thereby acquire an at once dynamic and static appearance. 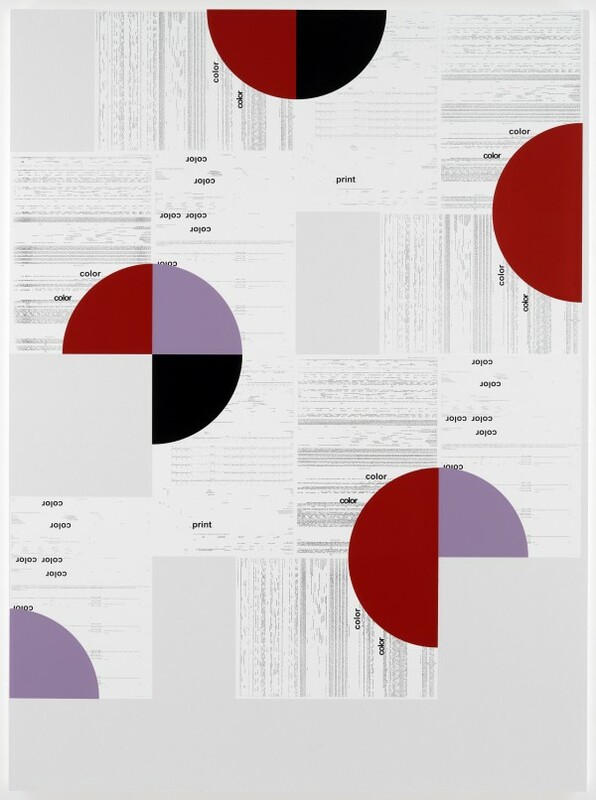 Riedel has further highlighted an individual word on each canvas, such as “click,” “type,” “color,” “alt,” and “doubleclick,” referring to computational commands, while also reﬂecting the steps and techniques used to produce the works. 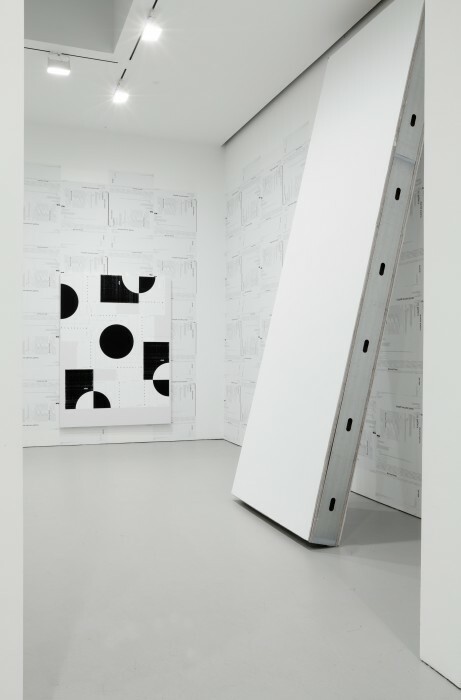 The canvases are hung against wallpaper printed with text from the David Zwirner website, http://www.davidzwirner.com/artists.htm. 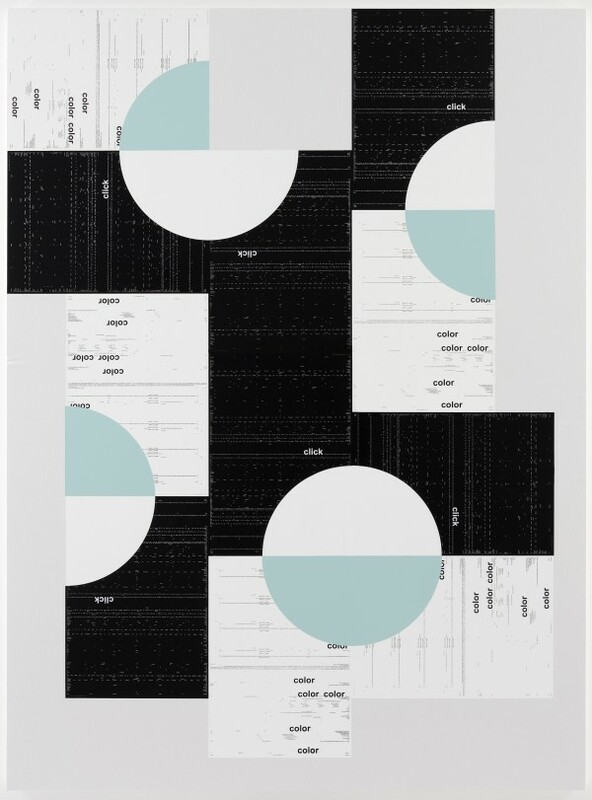 Yet the stylized nature of web formatting, coupled with Riedel’s interventions, serve to obliterate the individual particularities of the respective sites referenced in his works. 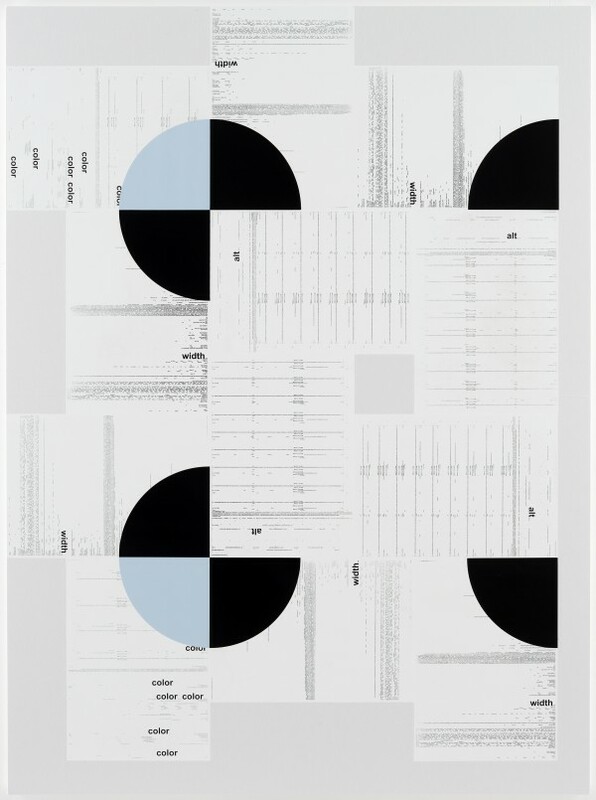 Common for the different fragments of text is not so much that names, nouns, verbs, letters, punctuation, and syntax are re-appropriated, but that text itself becomes a material that the artist can work with. 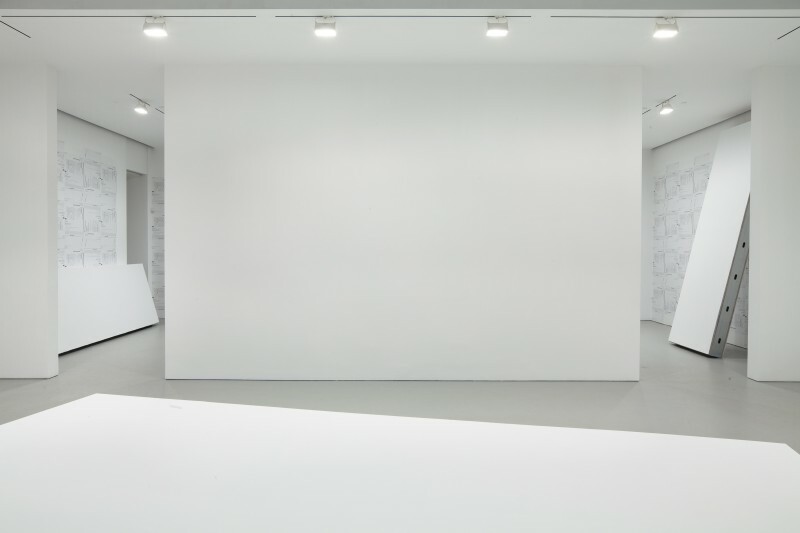 As such, the present exhibition forms part of a larger strategy of “writing” with writing. Also on display will be a series of catalogues created by folding designs of the “poster paintings” into an A4 format and stapling the sheets together. 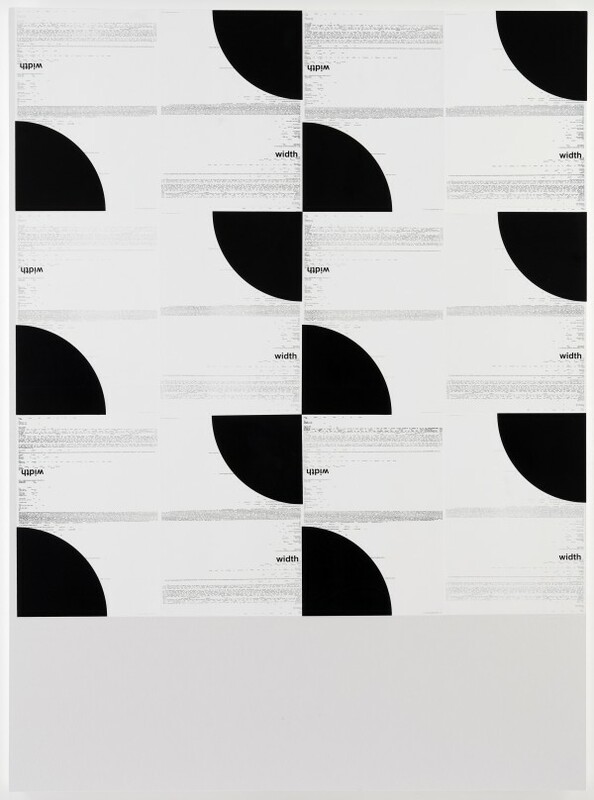 A postcard-insert illustrates how the poster for each particular catalogue has alternatively been arranged on canvas, thus offering the possibility of dismantling the publication to re-create the original format. The catalogues are presented on a dislocated gallery wall, which Riedel has placed ﬂat on the ﬂoor for visitors to sit on while “browsing,” thereby generating a dual use for a device typically intended for display. 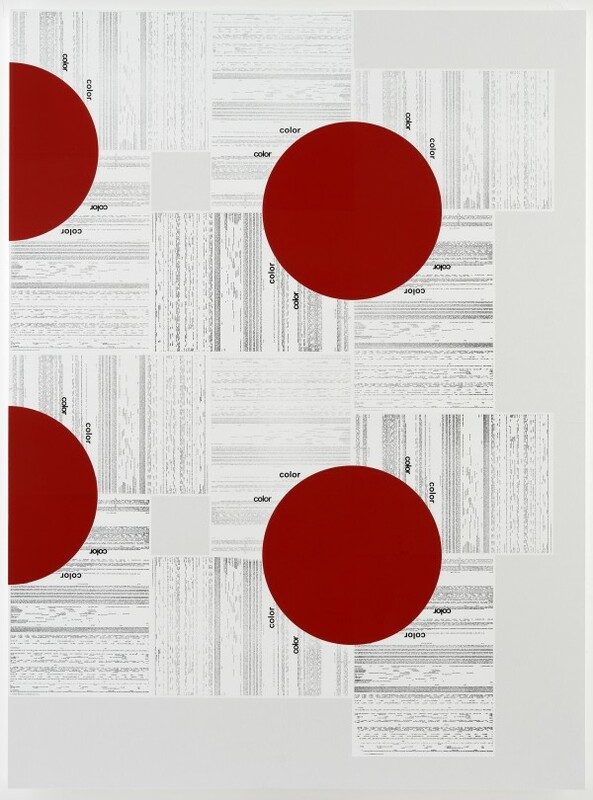 These catalogues, along with Riedel’s silkscreened canvases, are tactile and playful constructions which embody the particular “click-aesthetic” that permeates the artist’s larger oeuvre. Symptomatic of his disruptive and animated treatment of texts, the exhibition’s title, The quick brown fox jumps over the lazy dog, has little signiﬁcance in terms of content, but is a sentence that contains each letter of the English alphabet at least once. This pangram has been used for over a century to display typefaces and to test typewriters and computer keyboards. Here, it serves to underscore the staccato relationship between text, canvas, paper, and architecture explored in the present exhibition. 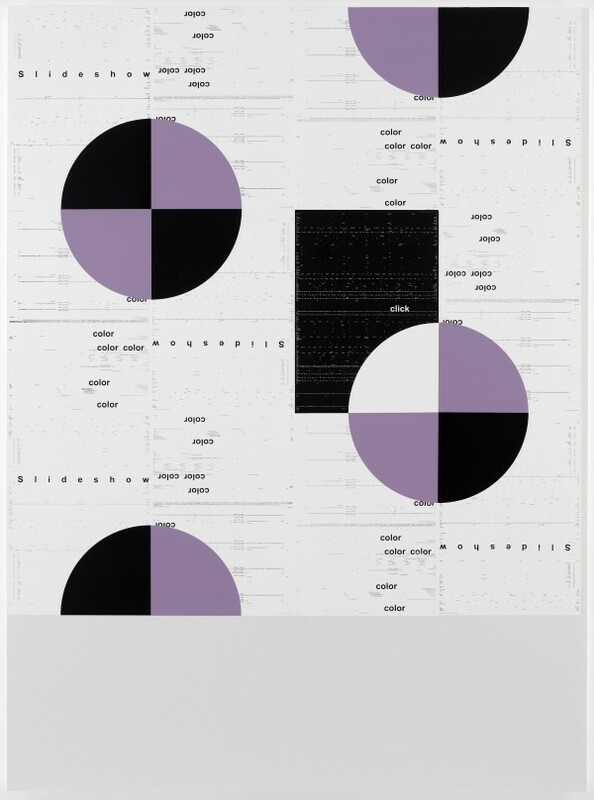 Michael Riedel’s work has been the subject of solo exhibitions at the Kunstverein, Hamburg (2010); Städel Museum, Frankfurt (2008); Kunstraum Innsbruck, Austria (2007); and Portikus, Frankfurt (2002). His work has also been shown in major group exhibitions at prominent venues and exhibitions throughout Europe including the Galleria Civica d’Arte Moderna e Contemporanea (GAM), Turin (2010); Tate Modern, London (2009); the Lyon Biennale of Contemporary Art (2007); the Moscow Biennale at the Lenin Museum (2005); and the Vienna Secession (2003). In 2000, Riedel founded Oskar-von-Miller Strasse 16 in Frankfurt, an exhibition space where he has staged readings, concerts, and other events, all using the same strategy: recording, labeling, playback. 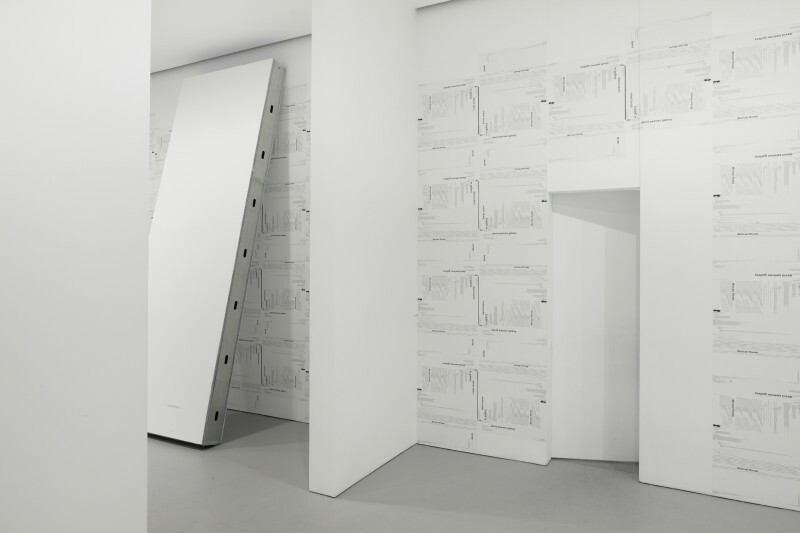 Following his move to Berlin in 2005, Oskar-von-Miller Strasse 16 was re-opened in the city, and since relocating back to Frankfurt in 2010, the artist continues to operate the space at a new address. Events have included Gert & Georg (Gilbert & George) (2002), where Riedel hired two actors to mimic artists Gilbert & George at an exhibition opening nearby, as well as Clubbed Clubs (2001-2007) and Filmed Films (1999-2002), where he restaged entire club nights and screened replays of ﬁlms ﬁlmed at movie theaters. His two previous solo shows at David Zwirner comprised a return to his Filmed Films archive (Michael Riedel: Filmed Film, 2008) and a recreation of a Neo Rauch show held at the gallery, with black and white digital prints of the painter’s works reproduced as panels and mounted in various conﬁgurations in the same position the originals were hung. 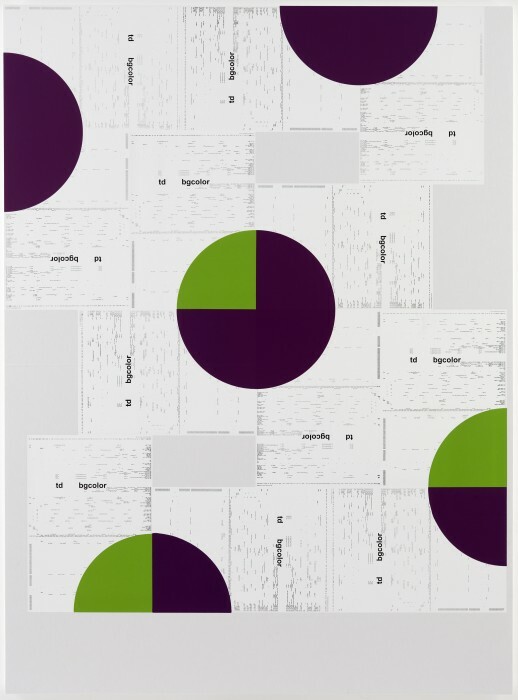 In contrast to Rauch’s static paintings, Riedel’s panels could be put together in a near-endless number of arrangements (Michael Riedel:Neo, 2005). 1 Michael Riedel, lecture delivered at The Kitchen, New York, May 8, 2010.